Holy Angels continues to offer forums for students to develop their Creative Writing and Oral Presentation skills. The Creative Writing class encourages budding writers to learn the conventions of various writing forms and to develop their voice and style. Students in the class also learn oral presentation skills and develop confidence and poise when reading from the podium at their annual poetry and prose reading. The students submit their work in book format as a culminating project in the class many also create images that complement their writings in the texts. The books are shared with the AHA community and put on display in the Learning Commons. Chips, AHA's newspaper, continues in its online format, which allows students to integrate video and audio segments into the text of the paper. AHA's literary magazine, Blueprint, also offers students the opportunity to publish their poetry and prose. The Writer’s Society provides students with an informal forum to workshop their work and to develop a writing community. Students annually celebrate National Poetry Month with Random Acts of Poetry throughout the campus. Alumnae return to campus to share experiences in the areas of both writing and in the field of communications. 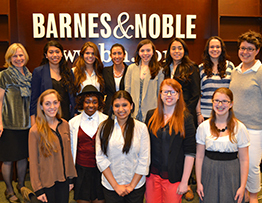 Students are recognized by local and national organizations for their poetry and essays. 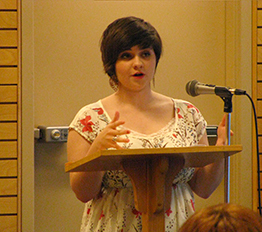 AHA students annually attend the Geraldine R. Dodge Poetry Festival.